The Gypsy steak is also one of my favorites. It has a very delicious taste, but unfortunately it is quite heavy food as most of the Hungarian foods are. But I have very good news: cooking this steak is very easy. You don’t need to by too many ingredients, and it can be ready in 1 hour. So, I highly recommend trying it out. Cut the chop on finger's breadth slices and tenderize them. Chop the garlic in small pieces and mix them up in a dish with 5-6 tablespoon oil and add salt, pepper and paprika powder. 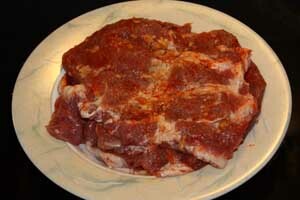 Spread both sides of the meat slices with this mixture. Put the meat on top of each other and leave them in the fridge for at least an hour. Cut the bacon in slices. Hack the top of them and finally fry the bacons. If they are ready, sprinkle some red paprika on them. 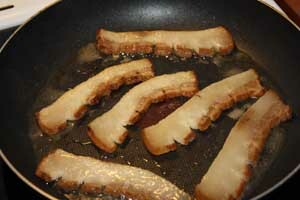 After the bacon is ready, you should fry the meats in oil. 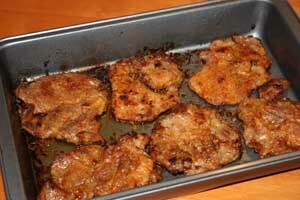 Or if you want to sharpen the taste, you can fry the meats in the fat of the bacons. 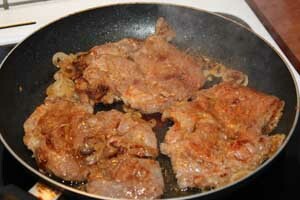 If you would like to make softer your Hungarian Gypsy Steak, I recommend frying it only for 10 minutes in the fry-pan. After that put the semi-finished meat in a baking dish, cover them with aluminum foil and continue the roasting in the oven on 200 Celsius degree (390 Fahrenheit). Fry the French fries. 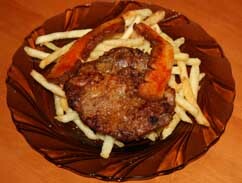 Make a heap from the French fries on a plate and put the Gypsy steak on it. Finally you have to crown your masterpiece with the fried bacon, as you can see it on the picture. 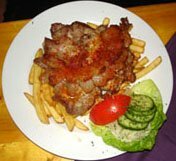 As this traditional Hungarian food is quite heavy, I highly recommend serving it with some salad or pickles. I hope your first Hungarian Gypsy steak was a great success. I’m always happy to hear about your success stories, so please share it with me.